We at Jaguar Freeport could not be more ecstatic about adding the soon-to-be-released Jaguar F-Pace to our new inventory. An SUV that puts out stunning performance, the F-Pace is already being billed as the performance SUV of the future. Indeed, it’s the Jaguar F-Pace engine that has everyone so excited. Here are our thoughts on this SUV’s performance specs. Nothing beats the strength and cunning of a Jaguar, especially the Jaguar F-Pace. But it’s not a luxury sedan—it’s a high-performing, world-class SUV. The F-Pace has three engine options, all of which are linked to all-wheel drive powertrains. The first, coming standard, is a 4-cylinder, 2.0L diesel engine that gets 180 hp and 318 lb-ft of torque. Paired to a smooth and versatile 8-speed ZF automatic transmission, it reaches 60 mph in 8.2 seconds and reaches a top speed of 129 mph. Your second engine option is a supercharged, 3.0L V6 engine that puts out an incredible 340 ponies and 332 lb-ft of torque—that’s on an SUV, folks. It accelerates from 0-60 in 5.4 seconds, and its top speed is 155 mph. Now that’s supercharging. 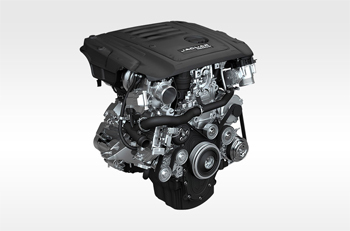 The highest engine options is a supercharged, 3.0L V6. With righteous fury, it gets 380 horses and takes you from 0-60 in 5.1 seconds. Though the mpg ratings for the Jaguar F-Pace have yet to be announced, we fully expect them to be as outstanding as the performance specs. From the mood lighting to the InControl Touch connectivity suite, the Jaguar F-Pace brings you the best in luxury features—without compromising when it comes to performance. There’s a lot more you can learn about the Jaguar F-Pace engine. Contact Jaguar Freeport today to speak to a representative about this incredible new performance SUV.